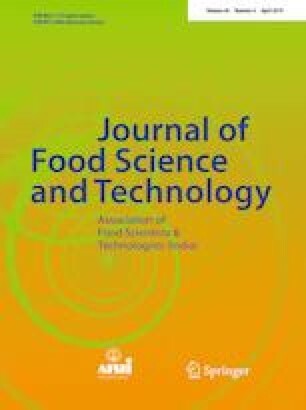 This work evaluated the production of dehydrated mangoes (Mangifera indica L.) and the effectiveness of ultrasonic-assisted osmotic dehydration on the drying kinetics of mangoes. Cube shaped mango samples were pretreated using ultrasound-assisted osmotic dehydration (UAOD) and dried in a circulating drying oven. An experimental design was created to evaluate the effect of pretreatment time and osmotic solution concentration on the water loss and sugar gain in the osmotic dehydration and on the drying time. The ultrasonic pretreatment was carried out in a bath ultrasound operating at 25 kHz and outputting 55 W/m3 of power. Osmotic solution ranging from 0 to 500 kg sucrose/m3 was applied in the treatments, and air drying was carried out at 60 °C. A mathematical model was developed for the osmotic pretreatment, and Fick’s law was used to model the air-drying process. The mass transfer coefficients were estimated for the ultrasonic-assisted osmotic dehydration, and the apparent water diffusivity was estimated for the air-drying process. The mass transfer coefficient ranged from 0.017 to 0.109 m2/s and the resistance to mass transfer at the surface ranged from 0.26 × 10−6 to 1.22 × 10−6 m2/s on the UAOD, while the apparent water diffusivity during air drying ranged from 5.94 × 10−9 to 8.41 × 10−9 m2/s. Mangoes presented a different behavior when compared to other fruits. The ultrasonic pretreatment was effective only when associated with an osmotic solution at 500 kg sucrose/m3. The authors acknowledge the financial support of the Brazilian funding agency CNPq and the INCT Frutos Tropicais.